So my data warehouse has reached the 150 GB size limit and it’s time to check if everything’s ok. Not that this size is too much, with about 300 agents and 170 MPs in production this is not huge. Nevertheless I learned not to be too confident on OpsMgr reliability and I don’t want my dw to grow too much. My retention period has always been 13 months, but really I don’t need 13 months of performance data or health state. 6 months are more than enough for our constantly changing environment. I opened the StandardDataSetAggregation table and changed accordingly the MaxDataAgeDays field then I waited 24 hours before doing any check (another lesson I learned is not to be in a hurry with OpsMgr, even if the dw promises to groom data very often, about every 4 hours). Alas, after this timeframe, my dw size was almost the same. I run a few sql statements on the common views (Alert.vAlert, Perf.vPerfHourly and so on) and I found out that my data was still there, I started to fear the grooming process wasn’t working. I was wrong. The net result is the MaxDataAgeDays needs to be read as “at least these days” + one data partition. The size of the data partition depends on the dataset configuration. This explains why I still have data older than the MaxDataAgeDays limit. To be sure and to have a way to regularly check the health state of the grooming process I developed a TSQL script, I’d like to share with the community. 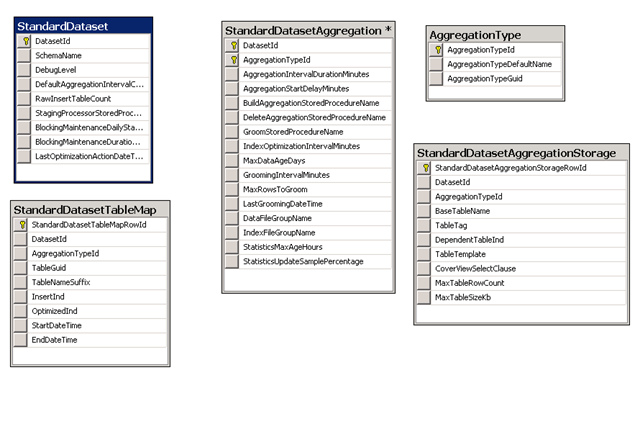 Basically the check takes into account every Dataset / Aggregation and calculates oldest and newest data in inactive partitions, oldest data in current partition (the partition that is being used to insert data), rows and size of the current partition, maximum row count and size configured for the dataset / aggregation. This entry was posted on February 18, 2009, 7:00 pm and is filed under Data Warehouse, SCOM. You can follow any responses to this entry through RSS 2.0. You can leave a response, or trackback from your own site. Does not appear this TSQL is available in either location now… Do you still have a copy? Great article! The link to the TSQL is broken though. Is there an alternate link? 1. We have Data retention for alerts is 90 days. 2. Fact: Maximum row count is 10Lac. 3. After 90 days we have only 50k row in the table. i. Does it mean that Alert Data will not groomed until the table is filled with 10Lac rows? ii. What type of data is been represented by the columns Reserved, Data, & Unused? yes you’re right the grooming process will truncate once it will fill up (10Lac row). Reserved stands for “allocated” so this is the space currently allocated for the table, data is the actual spce used for data and unused is the difference between the space allocated and the spce used. SQL allocates by discreet quantities. One suggestion, for the benefit of your future visitors. Format this post so the T-SQL script does copy into one long line. I had to break this up in Query Builder. This is a great idea. Thank you for sharing this with the community.